Barcrest are back with their hot new slot game which will take you back to the traditional slot machines. 7’s To Burn is extremely fun so make sure to give it a spin on Rocket Slots as soon as possible! 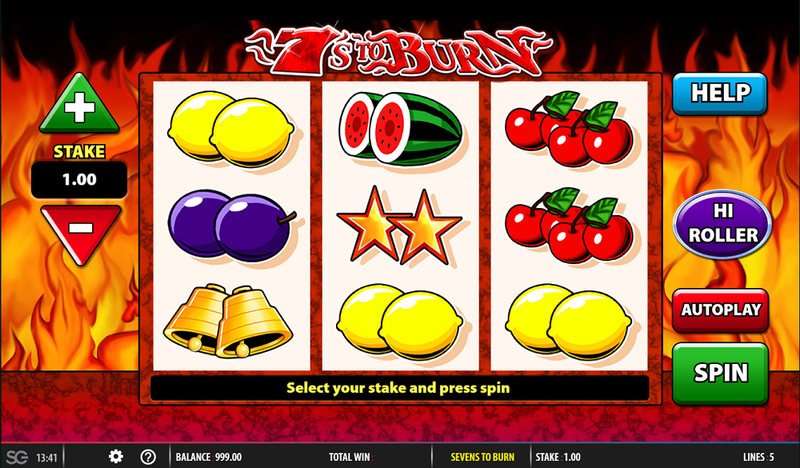 7’s To Burn is a game which comes with a lot of fire and plenty of classic symbols. The background is made up of a wall of flames which adds a bit of heat to the game and makes it more exciting. The overall design is simple but effective and everything you need is right there on the main screen so you can get started right away. If you love a traditional game, then you are going to love what Barcrest have done for you with this one. It’s called 7’s To Burn so you’ll find two different lucky seven symbols on there with the fiery one acting as the wild and the highest paying symbols. In terms of other symbols, you’ll find some fruit symbols including the watermelon, cherries and oranges appearing on the reels. These symbols are all brightly coloured and stand out against the white reels. Interested in taking a spin on 7’s To Burn? To get involved in the fun and win big you’ll need to decide on your initial bet across each of the 5 paylines in this game. This is really easy to do – you’ll find the buttons on the left of the reels. Next, you’ll press the spin button and watch the reels spin to reveal your win. For your prize fund to hit the roof, you’ll need to land a winning combination of three matching symbols. All of the payout details can be found on the paytable so make sure to take a look before spinning! If you are looking for a game with a huge number of bonus features, then this might not be the one for you as it is quite simple in design. Of course, there are some features which you can take advantage of to make your prize fund increase. Look out for the flaming seven wild symbol which will spin onto your reels if you are lucky. When you manage to land this, you’ll be able to swap it out for the lucky seven symbol to make a winning combination! For those who consider themselves high rollers, there is also a gamble feature in this game. If you decide to press the High Roller button, you’ll increase your stake and buy yourself 5 spins on the game. Doing this will half the payouts of the symbols but will make the burning wilds turn into wilds for any symbol on the reels. This is only for those who are feeling brave so think about this before pressing the button! Barcrest have done a great job of coming up with something that is simple but very exciting at the same time. 7’s To Burn will have you spinning all day as you try to get your hands on the jackpot. Make sure to get involved in the fruit machine fun by placing your bet and spinning those reels today to see what you can win!